Fox News was the dominant news source in the 2016 election, Pew survey finds. It should come as no surprise that Trump and Clinton voters got their news from different sources throughout the 2016 presidential campaign. But a report from Pew Research shines new light on just how disparate their media diets really were. Asked to name their “main source” for news about the campaign, 40 percent of Trump voters cited Fox News. That’s more than five times the number who cited any other source. CNN was second at 8 percent, followed by Facebook at 7 percent, and NBC at 6 percent. And what was the Fox News of the left? Actually, there wasn’t one: Clinton voters did not overwhelmingly flock to any single news outlet. Eighteen percent cited CNN as their main source for campaign news, 9 percent named MSNBC, and 8 percent said Facebook. Just 3 percent of Clinton voters named Fox News as their primary source. 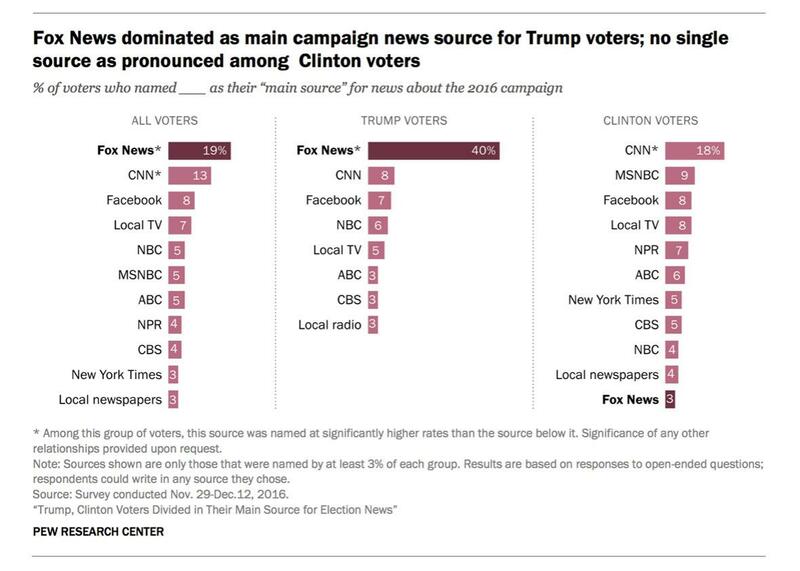 Unpopular as Fox News was among Clinton voters, some of Clinton voters’ top news sources were even less popular among Trump voters. MSNBC, NPR, and the New York Times were each cited by at least 5 percent of Clinton voters, but fewer than 3 percent of Trump voters. The results come from Pew’s survey of 4,183 U.S. adults who are part of a nationally representative panel. The survey was conducted from Nov. 29 to Dec. 12. The findings reinforce the conventional wisdom that the media and their audiences have polarized along with the electorate. But there are some surprising nuggets in the data, too. Facebook has been widely regarded as a leading platform for political news in the 2016 campaign, but just 8 percent of Pew’s respondents cited it as their main source. This stands in contrast to the frequently cited statistic that 44 percent of U.S. adults get their news from Facebook—a statistic that I critiqued in depth here. Facebook is certainly influential as a distributor of political news, but Pew surveys have consistently shown that television, and cable news in particular, are much more so. That should help to contextualize the fake news problem, which was always more significant for the flaws it highlighted in Facebook’s algorithm than for its direct impact on the presidential election. The data also help to illuminate why conservatives, including President-elect Trump, have so aggressively targeted CNN with criticism of liberal bias and untrustworthiness. CNN appears to be the last major media outlet that enjoys a sizeable number of loyalists among both Clinton and Trump supporters, putting it in a unique position to persuade the persuadable. The major news networks—NBC, CBS, and ABC—reach both camps as well but are cited as primary sources by no more than 6 percent of either one. Local newspapers, it’s worth noting, barely register as a primary source of election news among either group. It has been a long, sad fall for a sector that was once a pillar of the American news industry. Online media’s influence becomes visible, however, in the answers to another question, in which Pew asked respondents to identify outlets they turned to “regularly” for campaign news. Twenty-four percent of Clinton voters cited the Huffington Post here, compared with 9 percent of Trump voters. 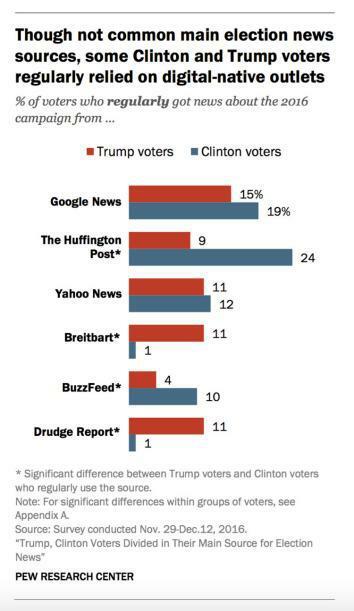 BuzzFeed also skewed liberal, while Breitbart and the Drudge Report were named almost exclusively by Trump voters. A takeaway from the survey is that, while MSNBC is often viewed as Fox News’ liberal equivalent, it is not nearly as influential among liberals as Fox News is among conservatives. There are different ways to measure influence, of course, but by the metric Pew used here—asking people to name their “main source” of election news—Fox News was more than four times more influential among Trump voters than MSNBC was among Clinton voters. In general, Clinton voters were much more likely to cite nonpartisan mainstream media outlets as their main news sources than were Trump voters. That distinction does not appear to be mirrored online, however, where both Clinton and Trump voters turn mostly to sources that appeal to one camp far more than the other. 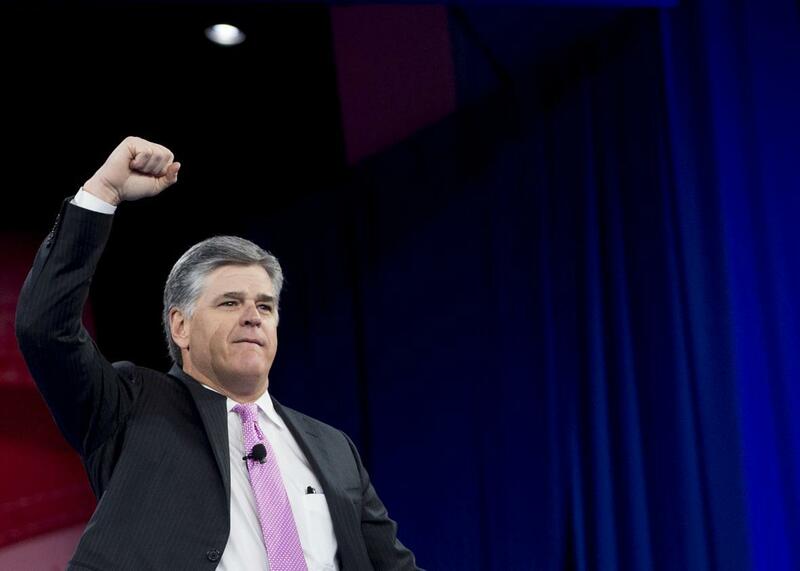 A second takeaway is just how dominant Fox News remains among conservatives, despite its internal turmoil and its occasional clashes with the Trump campaign. It was cited as the main campaign news source by 19 percent of all Pew respondents, significantly more than any other outlet, despite appealing almost exclusively to Trump voters. And while it is often lumped in with other “conservative media,” such as Breitbart, Drudge, and conservative talk radio, it stands along among them in the sheer scale of its loyal audience. To be fair, smaller outlets matter more than a survey like this might suggest. Asking people to name just one main source of news obscures not only the many sources that supplement their news diet, but also the many sources that large news outlets rely on in their newsgathering. This is not a full picture of the American news media diet, but a snapshot taken through a prism. Still, it’s a revealing one. It reminds us that the “mainstream media” are liberal only if you don’t count Fox News among them—and that Fox News is, in some respects, the most mainstream of them all.